Orlando, FL- I know I should really write in chronological order for y’all that are just reading the days events. I just can’t. In the first day of the trial of the State of Florida v. Casey Anthony I went through a “Steel Magnolias” equivalent of tissues the first half, and proceeded to sharpen our Henkels in the afternoon for reasons I cannot explain. Linda Drane Burdick, in her smart and gas-can-red suit, riveted the jurors, the public, and even the defendant, Casey Anthony. Ms. Anthony shook her head no at all the places she does not want you to look. Ms. Anthony cried on cue. Very upsetting this business of your daughter’s skull in a bog where you left it, with the intention of never seeing it again, and all the nastiness that comes with such an imposition. In a most level and calculated fashion, Burdick took us through the timeline with resolve. While none of us ever really wanted to get to the “end”, we did, and she is right, there is no other that had access to the evidence in this case. Asking this jury to find a verdict of guilty is going to be like asking who wants ice cream on the way back home. 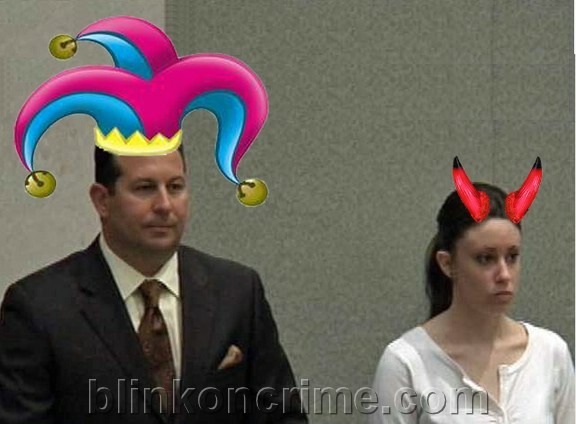 Enter famed Mayberry Attorney Barney Fife, I mean self-proclaimed “Juanie Cochran” , Jose Baez after lunch with his clients proclamation that Caylee Marie Anthony died on June 16, 2008 while both Casey and George were present, by an accidental drowning in the above-ground swimming pool. That was just the start of the delusion for public consumption. If you did not raise your glass and look at the bottom in the light, you were not paying close enough attention. Am I really hearing this? Is there something in my water? Kronk was kronked again, and accused of hiding Caylee’s remains from some unknown place, but ending up in the Suburban junkmess; and motivation for a reward as opposed to relieving himself was the reason he came upon her tiny skull. Through her attorney, Casey Anthony did exactly what I have said she would do. She blamed George for not reporting Caylee’s death and Cindy for leaving the ladder up to the pool , and wept while Baez told us all that Casey was sexually abused from the age of 8. Disclaimer– exclusive original content copyright and property of Internet Network News, LLC and Blinkoncrime.com. Reproduction of this article , ANY OF IT’S CONTENTS, in whole or in part without proper attribution and source link is strictly prohibited without prior written permission. Orlando, FL– Where did we first hear the name Zach Hopkins in the case of missing and eventually found murdered 34 month old Caylee Anthony? He was the non-existent son of Casey Anthony’s former schoolmate, Jeffrey Hopkins. He was the non-existent grandson of Jeff’s parents who got the phone call from the Anthony home about 5 AM July 16th, and follow up from brother Lee that he did not believe his sister. The other Zach Hopkins, who is not a toddler, is in no way affiliated with this case, is an actor. Zach appears in this Video created for Blue Fish TV and launched June 14, 2008 in honor of FATHERS DAY.